سیفی, سودابه, علیزاده, امین, داوری, کامران, بنایان اول, محمد. (1394). ارزیابی توابع کاهش جذب آب در شرایط تنش همزمان شوری و خشکی در گیاه چمن. نشریه آبیاری و زهکشی ایران, 9(1), 131-142. سودابه سیفی; امین علیزاده; کامران داوری; محمد بنایان اول. "ارزیابی توابع کاهش جذب آب در شرایط تنش همزمان شوری و خشکی در گیاه چمن". نشریه آبیاری و زهکشی ایران, 9, 1, 1394, 131-142. سیفی, سودابه, علیزاده, امین, داوری, کامران, بنایان اول, محمد. (1394). 'ارزیابی توابع کاهش جذب آب در شرایط تنش همزمان شوری و خشکی در گیاه چمن', نشریه آبیاری و زهکشی ایران, 9(1), pp. 131-142. سیفی, سودابه, علیزاده, امین, داوری, کامران, بنایان اول, محمد. ارزیابی توابع کاهش جذب آب در شرایط تنش همزمان شوری و خشکی در گیاه چمن. نشریه آبیاری و زهکشی ایران, 1394; 9(1): 131-142. قسمت چشم­گیری از ایران را مناطق خشک و نیمه­خشک دربرگرفته و این مناطق معمولاً با خشکی و شوری مواجه هستند. از سوی دیگر بهره­وری آب در این مناطق نیز معمولاً پایین می­باشد. مدل­های ریاضی که رابطه ی متغیرهای مزرعه­ای (مانند رطوبت خاک در دسترس) را با مقدارتعرق گیاه شبیه­سازی می­کنند، یکی از ابزارهای مفید مدیریتی می­باشند. در زمینه چگونگی پاسخ گیاهان به تنش همزمان شوری و خشکی و سهم هریک از آن­ها در کاهش جذب آب، مدل­های ریاضی متعددی وجود دارد. در این مطالعه شش تابع کاهش جذب آب ماکروسکوپی(Van Genuchten, 1987)(جمع­پذیر و ضرب پذیر)، (Dirksen and Augustijn, 1993)،(Van Dam et al, 1997)، (Homaee,1999)و (Skaggs et al, 2006) با استفاده از داده­های گلخانه­ای چمن چچم(Lolium prenne)مورد ارزیابی قرار گرفت. آزمایش به صورت فاکتوریل در قالب طرح کاملاً تصادفی با چهار سطح شوری (5/0، 5/5، 5/7 و 10 دسی زیمنس بر متر) و سه سطح خشکی(100، 75 و 50 درصد ظرفیت زراعی) و سه تکرار به انجام رسید. نتایج نشان داد در شوری­های کم، واکنش چچم به تنش همزمان شوری و خشکی جمع پذیر است؛ در حالی­که در شوری­های بالاتر از 5/5دسی زیمنس بر متر، مدل­های ضرب پذیر برازش بهتری دارند. از میان مدل­های ضرب پذیر، مدل­­های Skaggs et al، Homaee و Van Genuchten برازش بهتری نشان دادند. A significant part of Iran lays in arid and semi-arid regions, that face with drought and salinity. In other hand, Water use efficiency under this condition is generally low. Mathematical models that simulate transpiration of plant as a function of soil moisture availability are useful tools for water productivity management.Various mathematical models have developed to estimate transpiration of plant reduction due to combined effect of drought and salinity stresses. This study compares six different macroscopic reduction functions; namely: Van Genuchten (additive and multiplicative, 1987), Dirksen & Augustijn (1993), Van Dam et al. (1997), Homaee (1999) and Skaggs et al. (2006). These models were evaluated against measured transpiration of turfgrass (Lolium prenne) in greenhouse environment for 12 treatments. The factorial experiment was performed based oncompletly randomized design with four levels of salinity (0.5, 5.5, 7.5 and 10 dS/m) and three levels of drought (water refills of 100, 75 and 50 %FC) and three replicates for each treatment. The results indicated that the crop response to water and salinity stresses is additive in low salinity level and is multiplicative at salinity level above 5.5 dS/m. Among used models, reduction functions of Skaggs et al, Homaee and Van Genuchtenshowed better agreement with the measured data. شهیدی،ع.، نحوی­نیا،م.ج و پارسی نژاد،م. 1389. ارزیابی توابع کاهش جذب آب در شرایط تنش همزمان شوری و خشکی توسط رقم روشن گندم. مجله پژوهش آب، 4. 7: 1-12. علیزاده، ا. 1383. فیزیک خاک. دانشگاه فردوسی مشهد. چاپ اول. علیزاده، ا.1389. رابطه آب و خاک و گیاه. دانشگاه فردوسی مشهد. 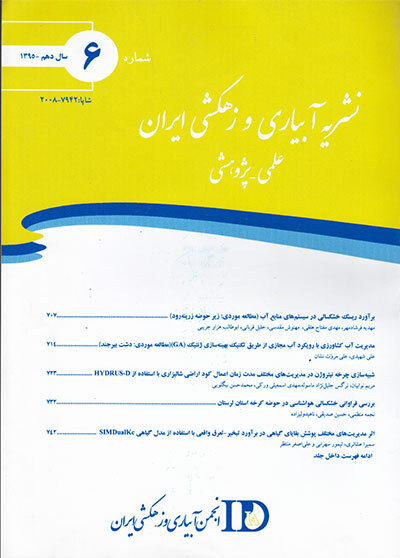 چاپ یازدهم. علیزاده،ح.ع.، لیاقت،ع.م و نوری محمدیه،م. 1388. ارزیابی توابع کاهش جذب آب توسط گوجه فرنگی در شرایط تنش همزمان شوری و خشکی. نشریه آب و خاک (علوم و صنایع غذایی)، 23 .3: 88-97. کافی، م. 1389. کشاورزی شورزیست: راهبردهای مدیریت گیاه آب و خاک. دانشگاه فردوسی مشهد. کیانی،ع.،همایی،م و میرلطیفی،م. 1385. ارزیابی توابع کاهش عملکرد گندم در شرایط توأم شوری و کم آبی. مجله علوم خاک و آب. 20 .1: 73-83 . Aronson,L.J.,Gold,A.J., Hull,R.J. 1987. Cool-season turfgrass responses to drought stress. Crop Science.27: 1261-1266. Bresler,E. McNeal,B. L., Carter,D.L. 1982. Saline and Sodic soils.Advanced series in Agricultural.Sciences. 10. 236. Cardon,G.E., Letty,J. 1992. Plant water uptake terms evaluated for soil water and solute movement models. Soil Science Society of America Journal. 32: 1876-1880. Childs,S.W., Hanks,R.J. 1975.Model of soil salinity effects on crop growth.Soil Science Society of America Journal. 39: 617-622. Denmead,O.T., Shaw,R.H. 1962. Availability of soil water to plants as affected by soil moisture content and meteorological conditions. Agronomy Journal. 54: 385-390. Dirksen,C.,Augustijn,D.C. 1988. Root water uptake function for nonuniform pressure and osmotic potentials. Agronomy Journal.15:188(Abstracts). Dirksen,C, Kool,J.B., Koorevaar,P., Van Genuchten,M.Th. 1993. HYSWASOR-Simulationmodel of hysteretic water and solute transport in the root zone. In: D. Russo and G. Dagan (editors). Water flow and solute transport in soils. Springer Verlag Berlin, .99-122.Advanced Series In Agricultural Sciences no. 20. Feddes,R.A.,Bresler,E., Neuman,S.P. 1974. Field test of a modified numerical model for water uptake by root system.Water Resources Research. 10.6: 1199-1206. Feddes,R.A.,Kowalik,P., Kolinska-Malinka,K., Zarandy,H. 1976. Simulation of field water uptake plants using a soil water dependent root extraction function.Journal of Hydrology. 31:13-26. Feddes,R. A.,Kowalik,P., Zarandy,H. 1978. Simulation of field water use and crop yield.Center for Agricultural Publishikg and Documentation(PUDOC), Wageningen. Gardner,W.R. 1960. Dynamic aspects of water availability to plants. Soil Science. 89: 60-73. Gardner,W.R. 1964. Relation of root distribution to water uptake and availability. Agronomy Journal. 56: 41-45. Green,S.R., Kirkham,M.B., Clothier,E. 2006. Root uptake and transpiration: From measurements and models to sustainable irrigation. Agric. Water Manage. 86: 165-176. Hansen,G.K. 1974. Resistance to water transport in soil and young wheat plants. Acta Agriculturae Scandinavica. 24: 37-48. Hansen,G.K. 1975. Resistance to water flow in soil and plants, plant water status, stomatal resistance and transpiration of Italian ryegrass, as influenced by transpiration demand and soil water depletion. Acta Agriculturae Scandinavica. 24: 83-92. Herkelrath,W.N.,Miller,E.E., Gardner,W.R. 1977. Water uptake by plant. II: The root contact model. Soil Science Society of America Journal.41: 1039-1043. Hillel,D., Talpaz,H., Van Keulen,H. 1976. A macroscopic model of water uptake by a nonuniform root system and of water and salt movement in the soil profile.Soil Science.121.4: 242-255. Homaee,M. 1999. Water uptake under nonuniform transient salinity and water stress. PhD Thesis, Wageningen Agricultural University. Homaee,M.,Direksen,C., Feddes,R.A. 2002. Simulation of root water uptake. I. Nonuniform transient salinity using different macrodsopic reduction functions. Agricultural Water Management. 57: 89-109. League,K., Green,R.E. 1999. Statistical and graphical methods for evaluating solute transport models: Overview and application.Journal of Contaminant Hydrology. 7: 51-73. Maas,E.V., Hoffman,G.J. 1977. Crop salt tolerance-current assessment. Journal of Irrigation and Drainage Division.103.2: 115-134. Mathur,S., Rao,S. 1999. Modeling water uptake by plant roots. Journal of Irrigation and Drainage Division., 125.3: 156-165. Meiri,A.,Shalhevet,J. 1973. Pepper plant response to irrigation water quality and timing of leaching. Ecological studies Springer.4: 421-429. Molz,F.J. Remson,I. 1970. Extraction term models of soil moisture use by transpiring plants. Water Resources Research, 6: 1346-1356. Molz,F.J. Remson,I. 1971. Application of an extraction term model to the study of moisture flow to plant roots. Agronomy Journal, 63: 72-77. Nimah,M.N., Hanks,R.J. 1973. Model for estimating soil water, plant, and atmospheric interrelations: I. Description and sensitivity. Soil Science Society of America Journal. 37: 522-527. Parra,M. A., Romero,G. C. 1980. On the dependence of salt tolerance of beans (Phaseolus vulgaris L) on soil water matric potential.Plant Soil. 56: 3-16. Rowse,H.R., Stone,D.A., Gerwitz,a. 1987. Simulation of the water distribution in soil.2.The model for cropped soil and its comparision with experiment.Plant Soil. 49: 500-534. Sepaskhas,A.R., Boresma,L. 1979. Shoot and growth of wheat seedlings exposed to several levels of matric potential and NaCl-induced osmotic potential of soil water Agronomy Journal. 71: 746-752. Skaggs,T.H., Van Genuchten,M.Th, Shouse,P.J., Poss,J.A. 2006. Root uptake and transpiration: From measurements and models to sustainable irrigations. Agricultural Water Management. 86: 140-179. Van Dam,J. C.,Huygen,J., Wesseling,J.G. , Feddes,R.A., Kabat,P., Van Walsum,P.E.V., Groenendijk,P., Van Diepen,C.A. 1997. Theory of SWAP, version 2.0.Simulation of water flow, solute transport and plant growth in the soil-water-atmosphere-plant environment. Report No. 71. Dept. of Water Resour., Wageningen Agricultural Univetsity. 167 pp. Van Genuchten,M.Th. 1987. A numerical model for water and solute movement in and below the root zone. Research. Report, U. S. Salinity Lab. Riverside, CA. Van Genuchten,M.Th.,Gupta,S.K. 1993. A reassessment of the crop salt tolerance response function. Indian Society of Soil Science Journal, 41(4): 730-737. Van Genuchten,M.Th., Hoffman,G.J. 1984. Analysis of crop production. In: I. Shainberg and J. Shalhevet (editors), Soil salinity under irrigation.Ecological Studies, 51: 258-271. Whisler,F.D., Klute,A., Millington,R.J. 1968. Analysis of steadt state evapotranspiration from a soil column.Soil Science Society of America Journal. 32: 167-174.